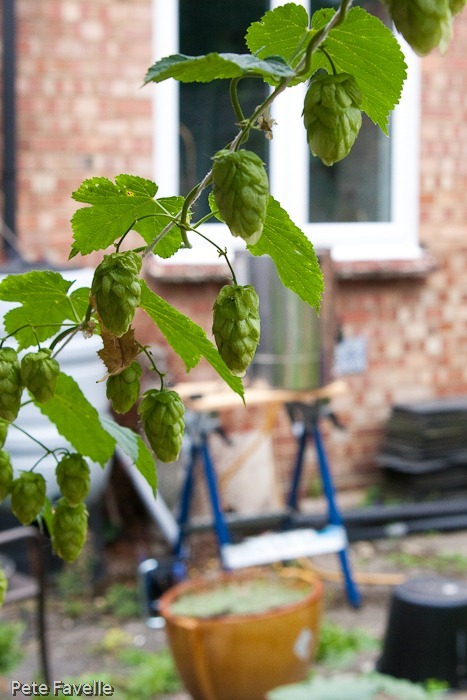 This year, there seems to have been an explosion in making ‘green hop beers’ – just about every brewery you look at seems to be making a special beer with the first hops of the season, straight from the bine. Having planted my first hop plant this spring, I wasn’t really expecting to see any hops on it this year so I was pleasantly surprised when I found it covered with a decent crop. Obviously I’d planted it to brew from, and a green hop beer seemed just the right thing. 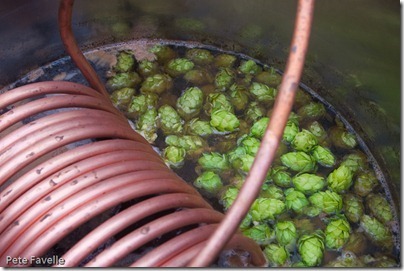 When it came to the recipe, I knew it needed to be something fairly light to let the hops shine through. 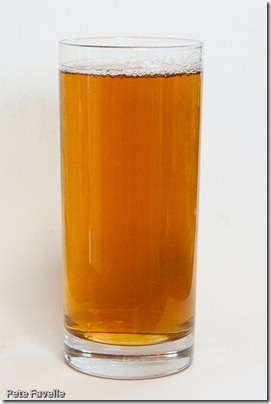 I went back to my trusty Zebedee recipe, although I tweaked up the bittering hops just a touch. My next decision was working out how many green hops to use; as they aren’t dried, they weigh significantly more than normal dry hops – anything up to five times as much. The official advice on how many green hops to use was “lots. Lots and lots and lots”. Green hop beer really needs to be enjoyed fresh, so that combined with the need for “lots” of green hops, I decided to make a 2.5 gallon batch instead of my regular five. Things began fairly well – my mash started out a little hot at 67 degrees, but it seemed to cope fine. A quick batch sparge, and the boiler was soon on. The green hop addition could not have been any fresher. At 10 minutes before the end of the boil, I started harvesting them from the bine by the handful, weighing them and then throwing them straight into the boiler. Although I have listed two 50g additions, it was really constant hopping by the handful for the last ten minutes, adding up to roughly 100g of very fresh hops (and probably the odd greenfly). It wasn’t until the wort was cooled and I was trying to run it into the fermenter that I made the horrible discovery that I’d managed to leave my hop filter in the drawer, instead of putting it back into the boiler after cleaning like I usually do. The result of this was that the tap very quickly clogged up and I was barely getting a dribble out of it. I then expressed my disappointment at this turn of events loudly and explicitly for a few minutes. Once I calmed down I realised that I was just going to have to break a few rules, and fit the hop strainer before I could continue. The wort was fairly cool by this stage, so that wasn’t an issue. What was more of an issue was that I had to stick my considerably hairy and not very easy-to-sanitise arm elbow-deep in the boiler to fit the damn thing. Happily, that fixed the problem and didn’t seem to cause any lasting issues. But, note to self, check the hop filter before turning the boiler on next time. After that, things went pretty painlessly. Once it was properly cool, I pitched with Windsor yeast and took an OG reading of 1039. A week later, at an ABV of 4.1%, it was ready to be tasted. It’s a glorious pale golden colour in the glass, with little or no fizz to it. The nose has a digestive biscuit hint to it, and a waft of green grass. There’s also just a suggestion of overripe berries – perhaps loganberry. 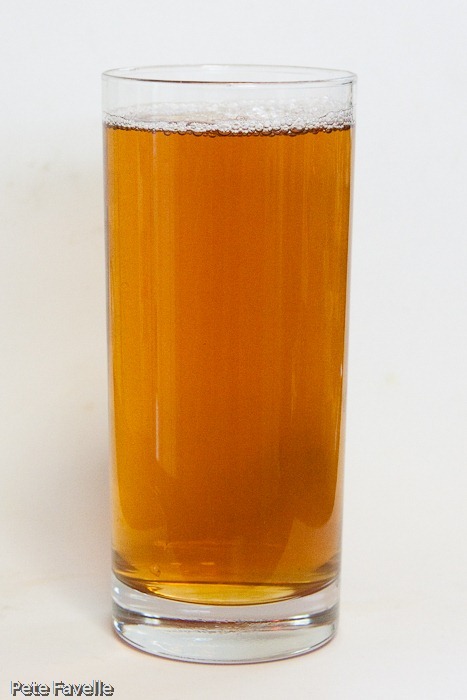 In the mouth, it’s obviously very light – some gentle honey sweetness, more green leaves that lead into a more significant bitter finish than Zebedee. Those green, fresh flavours make it a very refreshing and dangerously moreish beer, and I almost regret only making 2.5 gallons of it! Next year, I think it needs even more hops – I suspect it could happily take double the green hopping with no trouble at all. Now I just need to get a big enough crop.